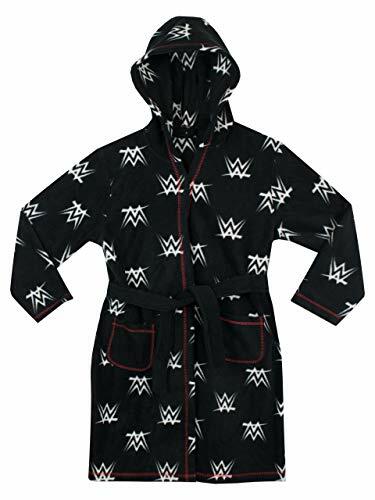 Boys WWE Robe. Even the mightiest wresting champions need some rest, and this super cosy black WWE robe is just the thing for them! Featuring a super cool pattern of the iconic WWE logo as well as an easy tie belt, pockets and hood. 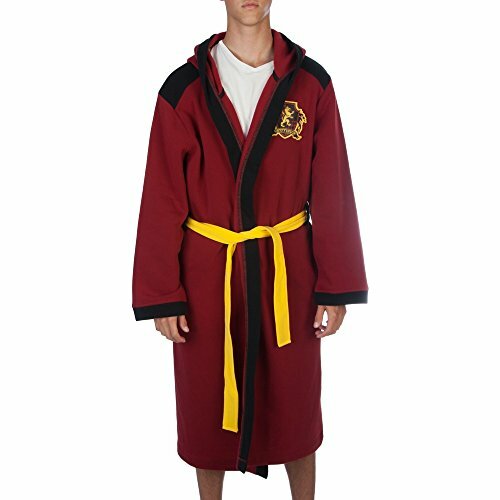 This World Wrestling Entertainment Robe is one for their collection! 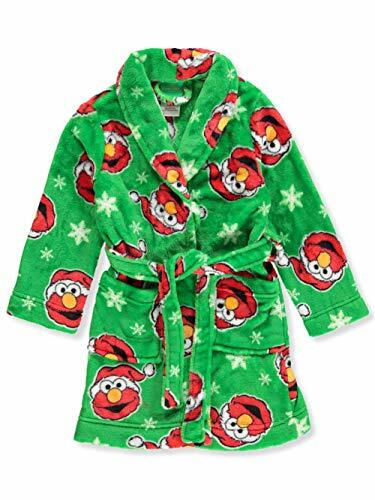 A must have for your little wrestler to relax in! 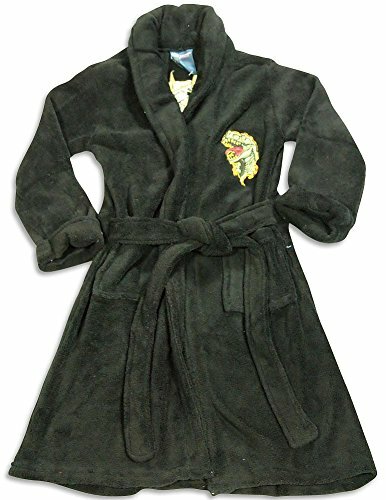 Brand new, officially licensed bathrobe for Harry Potter. 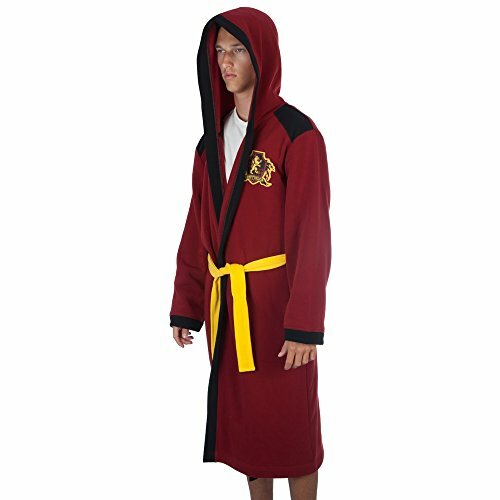 The robe is a super soft plush fabric and has two pockets. 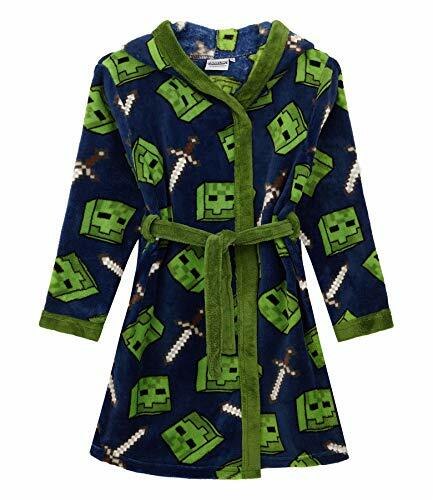 Add some extra comfort to your little one's bedtime routine with this Minecraft Creeper boy's bathrobe. Featuring the epic character green Creeper this hooded dressing gown will be sure to keep your minecrafters warm and cosy. 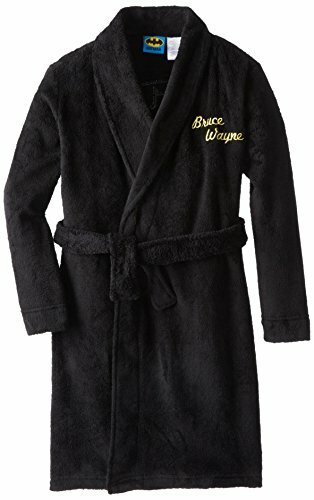 This bathrobe has long sleeves and tie belt and is made from 100% polyester. This product is officially licensed and has official branding throughout, please follow care label instructions carefully and ask for additional information about sizing if needed. The bathrobe is soft and comfortable with good heat preservation effect. Free to wear,home essential Unique and lovely appearance design,Hat,side and cuff plus think velvet,vivid and interesting Child Size (Without Hood) Small(120#):Length:69cm,Bust:38cm,Sleeve Length:42cm Medium(130#):Length:71cm,Bust:40cm,Sleeve Length:43cm Large(140#):Length:73cm,Bust:42cm,Sleeve Length:44cm Adult Size(Without Hood): M(Inch):Length 35.8;Sleeve 24.8;Hight:59.1-65.01 L(Inch): Length 36.6;Sleeve 25.2;Hight:65.01-70.92 Due to the difference in the size of the child,please try to refer to the actual size selection. Fabric comfort:use high-quality soft flannel fabric,skin affinity is extremely strong,after wearing feel very comfortable.A good assistant at night sleep for you and your child. 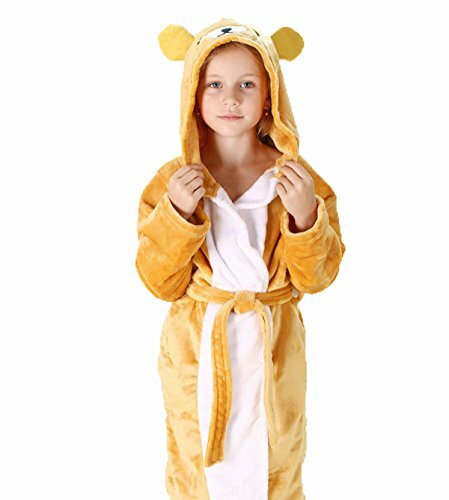 Lovely appearance:cartoon animal appearance design,rich childlike interest,color changeful suit your different choice,adult's and kid's robe appears particularly vivid and lovely. 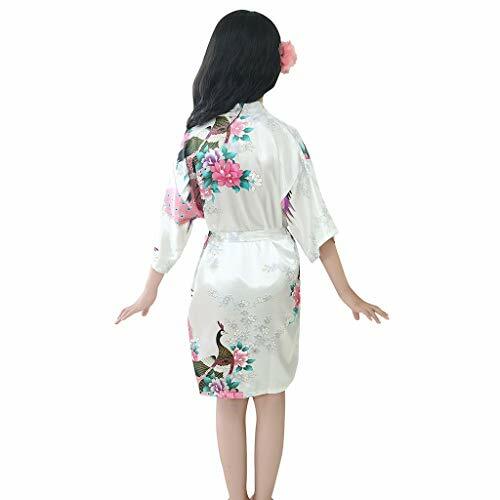 Convenient washing:This robe is made of high quality fabric,so you don't have to worry about washing in the washing machine,neither fading nor deformation. Suitable for all kinds of occasions:vivid and interesting appearance for all kinds of party places,birthday parties,Halloween,Christmas,cosplay,etc.Making you and your children stand out among the crowd. There may be some color differences when shooting.It is suggested that you carefully check the overall and detailed pictures of the product when buying. Deadpool is a disfigured and mentally unstable mercenary anti-hero who can laugh, joke, or freak out at any given time. He is the Merc with a Mouth who loves to talk and crack jokes. 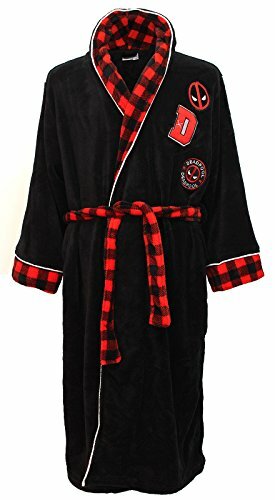 This officially licensed Marvel Deadpool adult plush robe features embroidered deadpool logo patches on front, along with a red and black plaid trim and waist tie. Made of 100% Polyester. 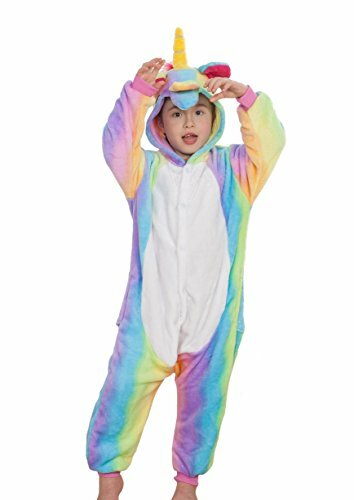 Size Chart: Recommended Age:18-24 Months ---Label Size:4 ---Bust:80CM/31.5'' ---Length:66CM/26.0'' ---Sleeve Length:18CM/7.1'' ---Height:85-95CM Recommended Age:2-3 Years ---Label Size:6 ---Bust:82CM/32.3'' ---Length:68CM/26.8'' ---Sleeve Length:19CM/7.5'' ---Height:95-105CM Recommended Age:3-4 Years ---Label Size:8 ---Bust:84CM/33.1'' ---Length:70CM/27.6'' ---Sleeve Length:20CM/7.9'' ---Height:105-115CM Recommended Age:4-5 Years ---Label Size:10 ---Bust:86CM/33.9'' ---Length:72CM/28.4'' ---Sleeve Length:21CM/8.3'' ---Height:115-130CM Recommended Age:5-7Years ---Label Size:12 ---Bust:88CM/34.8'' ---Length:74CM/29.3" ---Sleeve Length:22CM/8.7'' ---Height:130-145CM Features: 1.It is made of high quality materials,Soft hand feeling, no any harm to your baby skin 2.Casual style top, lovely, cute and comfy baby clothes 3.Great idea for a baby top, there's no doubt in our mind your little baby will be the cutest Product information: Gender:Girls Pattern Type:Floral Material:Polyester Clothing Length:Regular Occasion:Casual Package include:1PC Bathrobe+1PC Ribbons Both hand wash and machine wash is OK Please note that slight color difference should be acceptable due to the light and screen. Item Condition:New collections for newborn kids Material:Cotton Color:See the picture Features:High quality fabric material,classic kids outwear romper cosplay suit Cute & fashion cartoon movie outfit garment CherWow aimed at providing the best goods with newest designs to your cute baby kids. High-grade pure cotton fabric,brings skin-friendly feelings to your baby kids. Hand-wash recommended,if you want to keep babywear never out of shape. New collections for kids romper/sweatshirt suit/crawling costume suits,a combination of fashion style & high quality. Novelty Christams festival costume,suitable for gift choices for your children sweeties. Original brand owner,we also provide expedite shipping,if anything demands,please feel free to let us know. Features: Colorful cartoon design hood,2 big pockets,A button on the neck , a self-tie belt to protect the kid from the risk of cold. A great choice for the children:No one can resist the great charm of it.They must love the interesting robe with the 3D design. 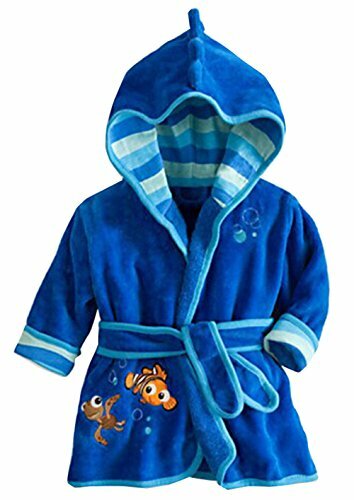 Occasion:Kids can wear it as bathrobe,homewear,housecoat , beach robe,cosplay party robe,Halloween costumes Christmas costumes. 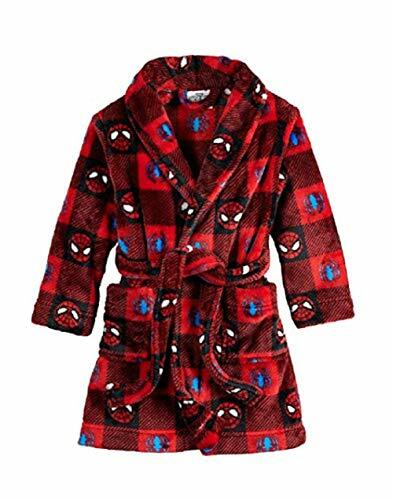 Kids can wear the robe all year with the suitable thickness. Matching tails and chest detailing help get your child's mind to run wild. Please check our size detail before you buy.Different kids have different body features,if your kid is a big size,please choose a size up. Star Wars is the greatest sci-fi story ever told In a universe far far away a battle rages. It is the fight between good and evil, the dark side vs the force. Jedi knights desperately try to save the people from the horrors of the Imperial Empire while brave rebels have formed an alliance to fight against this evil. The story is evolving. 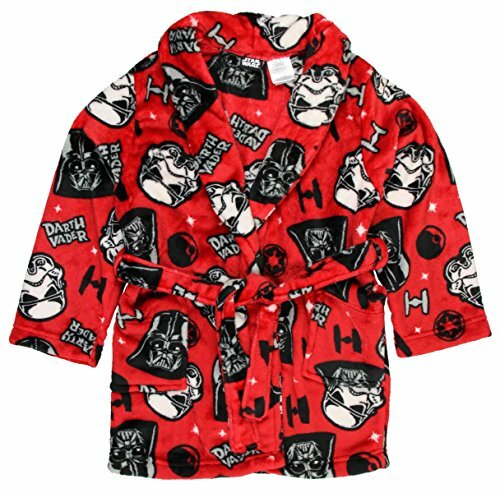 This soft polyester bathrobe will be great for the Star Wars fan in your house. Features:OUCHI newly presented a series of autumn winter kids flannel cosplay anime romper suit sleepwear Designed with cute animal sham hoodies version,casual cozy wearing feeling bring you a warm & unique comfortable moment. These comes with thicken and lightweight flannel fleece fabric,soft & skin-friendly. Ideally for couples/relatives/parent-child/cosplay masquerade party ball etc. Material: Soft & Skinfriendly Flannel Fabric. 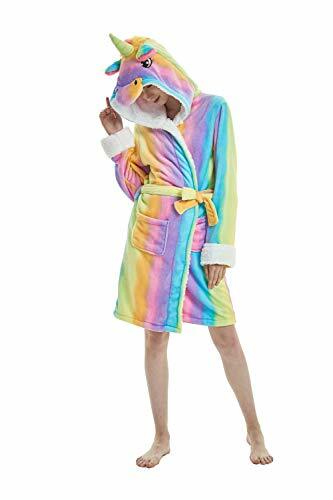 Cute hooded animal robe cape suit with belt. Lightweight & soft comfy wearing feelings. Please wash it in water under 30 degree , hang to dry, not sock for a long time,NEVER bleach. We guarantee:Normally our Standard shipping just needs 6-17 working days without unforseen situation or festival holiday delays, expedite shipping is also available through paying for the extra shipping fee,any special demands,please contact us freely. The bathrobe is soft and comfortable with good heat preservation effect Free to wear,home essential Unique and lovely appearance design,Hat,side and cuff plus think velvet,vivid and interesting Child Size (Without Hood) Small(120#):Length:69cm,Bust:38cm,Sleeve Length:42cm Medium(130#):Length:71cm,Bust:40cm,Sleeve Length:43cm Large(140#):Length:73cm,Bust:42cm,Sleeve Length:44cm Adult Size(Without Hood): M(Inch):Length 35.8;Sleeve 24.8;Hight:59.1-65.01 L(Inch): Length 36.6;Sleeve 25.2;Hight:65.01-70.92 Due to the difference in the size of the child,please try to refer to the actual size selection.